Economists estimate that the California drought will inflict about $2.2 billion of losses on the state's farm economy this year, including the loss of more than 17,000 jobs. The analysis, produced by UC Davis and the consulting firm ERA Economics, projects that about 430,000 farm acres will go unplanted for lack of water. In May, the same Davis study team was already projecting that the current drought would take about 410,000 acres of Central Valley farm land out of production -- nearly twice the area fallowed during the 2009 drought, about doubling the agricultural job losses as well. Karen Ross, who heads California's Department of Food and Agriculture, which commissioned the study, says this is the first time the state has attempted a thorough assessment of the socioeconomic impacts of a California drought. 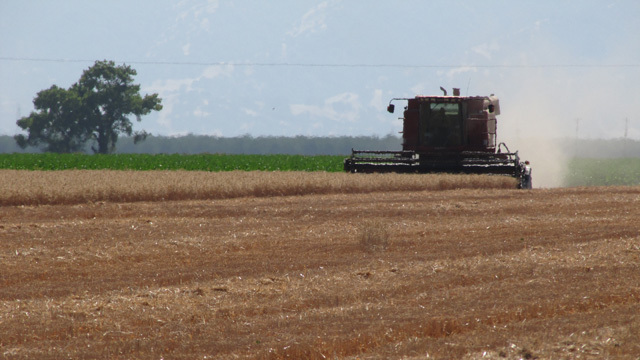 While the overall impact is a relatively small fraction of California's $42 billion farm economy, economist Richard Howitt, one of the study's co-authors, says the drought will produce "pockets of extreme deprivation," especially in the San Joaquin Valley and the arid corner of the Valley's farm belt known as the Tulare Basin. Ross says it's already evident from lines forming at food banks in the San Joaquin Valley. But Howitt says that the drought is so far having a lesser affect on food prices and is unlikely to produce shortages in supermarkets -- at least not yet. "With a drought, you're never really sure when it's gonna end," cautions Jay Lund, co-founder of the Center for Watershed Studies at UC Davis. His calculations favor the odds of a fourth dry year, with the chance of a "critically dry" year -- like this one -- about one in three. That's despite talk of possible El Niño conditions forming in the Pacific, often seen mistakenly as a harbinger of rain. "Don't count on El Niño for anything," says Lund. 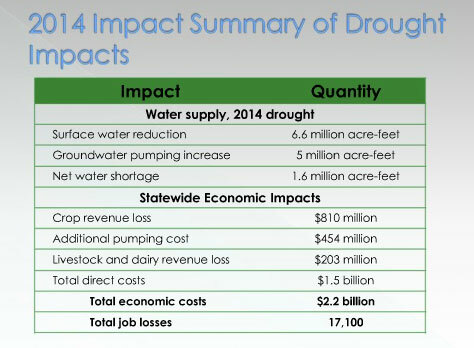 A fourth year of drought would change the game dramatically. A major reason for that is the aggressive pumping of groundwater that farmers have turned to in the absence of normal deliveries from reservoirs and canals. The Davis team estimates that increased pumping from aquifers could offset three-quarters of the surface water shortfall. But that can't go on forever. "It's quite clear that the underground groundwater is the reserve bank account," says Howitt. "We're like somebody who is so rich, they don't have to balance their checkbook," he told reporters in a briefing at the National Press Club, "because we still think we're in a groundwater-rich era. Every other Western state has started to measure its groundwater and we don't even measure our groundwater." This may well be the year that changes. California may be closer than ever to some political consensus toward tracking and regulating groundwater pumping. By next year at this time, farmers may not have as much leeway to pump, with or without state regulation. The price of pumping is rising steadily as shrinking aquifers require deeper wells. And the Davis team estimates that in some areas, as many as 15 percent of shallower wells could run dry within a year. Asked about the drought relief bill under consideration in Congress, Ross said it appears to be "on pause" currently and gave it a 50-50 chance of eventual passage. Ross, Lund and Howitt are in Washington D.C. to meet with lawmakers about the drought. In a cruel paradox, federal climate watchers reported that overall, the contiguous U.S. just had its sixth wettest June on record, though drought persists throughout much of the southwest.